We hold expertise and skills in offering a large range of Platform Elevator. 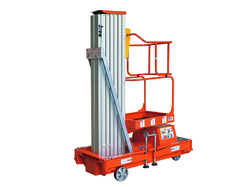 This Platform Elevator is used in commercial, industrial and many more application areas. Moreover, the product offered by our company is used for carrying people, freight and other from one floor to another. Stacker's & Mover's (I) Mfg. Co.
By utilizing modern machines and latest equipments, we are engaged in offering a wide range of Aerial Work Platform to meet the demands of our clients. All these products are rigorously tested on various parameters and are authorized as per the international standards. These products are easy to move and are light in weight. Our company is a leading manufacturer of Aerial Work Platforms or awps. 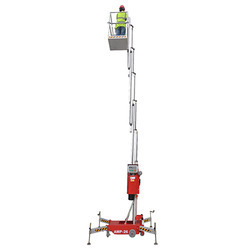 We have a wide range of aerial work platforms which are manufactured from high quality raw materials.